You all know I’m in love with Sonic. 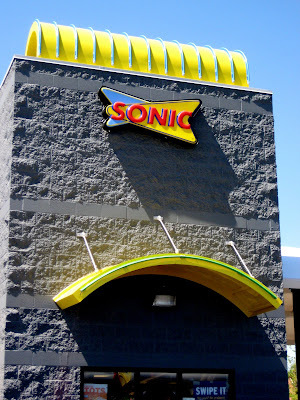 Ever since visiting the original Sonic in Oklahoma City, I’ve had an unhealthy obsession with this fast food drive-up joint. And when you’re a lady of leisure on a staycation, you can take road trips in the middle of the day so you can gorge yourself on Sonic goodness. The closest Sonic to me is now in Limerick. And in reality, it’s not really that far at all. You should know how this place works by now. You’ve seen the commercials. You drive up and order through that big ol sqwuak box. Carhops come out and give you your food. Then you stuff your face. You can also go through a regular drive-thru if you don’t want to eat in your car. There’s also some tables in the front so you can dine al fresco. 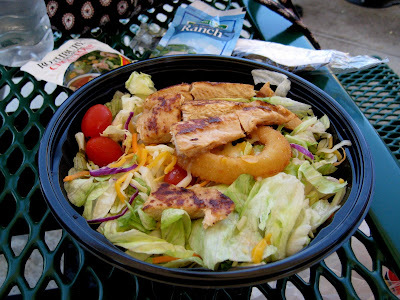 A got a grilled chicken salad. It comes with an onion ring. Her sister had raved about it so she had to get it. She liked it, but didn’t necessarily feel it was rave worthy. But it was still a good salad. 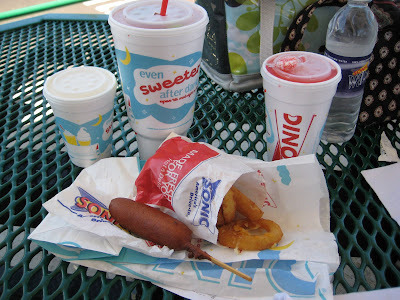 I wanted to leave plenty of room for drinks, that’s what I really love about Sonic, so I just had a corn dog and some onion rings. The corn dog was actually pretty good. A didn’t know what a corn dog was. She thought it was a cob of corn. Ha! The onion rings were delicious. The batter was great, just right, and the onions were sweet and well cooked. I don’t like it when the onions are crunchy, and these were perfectly cooked. Now there were only two of us but you see 4 drinks in that photo, all for us. I had an XL strawberry limeade and a regular banana cream pie shake for dessert. I just want you to see just how big this limeade is. Yes, it’s huge, and I drank it all… over the next couple of days. A got a real fruit strawberry slush, which she totally enjoyed, but she got a human sized one. 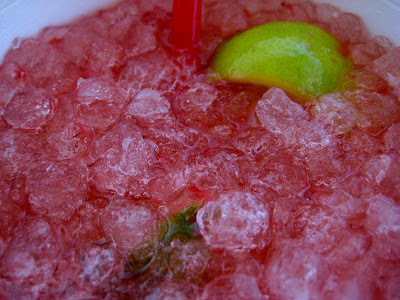 Oh a beautiful close-up of the strawberry limeade… with my favorite little ice pellets. I wish you could see the chunks of strawberries and taste them too.